Quinoa may have started as a health food trend, but it's become a staple in many health-conscious Americans' diets. And it's no surprise -- quinoa is filling, has a neutral flavor that works in many types of dishes, and it's loaded with nutritional value. Quinoa also has some nutrients that might help you shed pounds, so it makes a welcome addition to weight loss diets -- as long as you watch your portion size. Quinoa is moderately high in calories, so it's important to practice portion control if you want to lose weight. A cup of cooked quinoa is 222 calories, which might be as much as 19 percent of your daily calorie "budget" if you're following a 1,200-calorie diet. If you're not measuring your portion size, and accidentally eating more than one portion in one sitting, you might find it hard to shed pounds. But while quinoa isn't low-calorie, you'll get lots of nutritional value that promotes health while you lose weight. A 1-cup serving of cooked quinoa offers significant amounts of several B-complex vitamins -- nutrients important for a healthy metabolism -- plus essential minerals, like phosphorus, that your cells use to make DNA. Quinoa also contains significant amounts of magnesium, copper, manganese, zinc and iron. Each serving of quinoa also comes loaded with protein and fiber, which can help you lose weight. Simply eating more fiber -- at least 30 grams a day -- is an easy way to lose weight, according to Harvard Medical School, and each cup of quinoa contributes 5 grams toward this goal. The protein in quinoa helps stabilize your blood sugar and, because protein takes more energy to break down than carbs or fat, you'll actually burn more calories during digestion. A cup of quinoa has 8 grams of high-quality protein. There's some preliminary evidence directly linking quinoa to weight loss. One study, published in the Journal of Food Science and Technology in 2015, looked at the effect of quinoa on appetite in laboratory rats. The study authors found that rats fed quinoa ate less food overall than the rats who didn't eat quinoa. Other research suggests that 20-hydroxyecdysone, one of the compounds found in quinoa, might help with weight control. 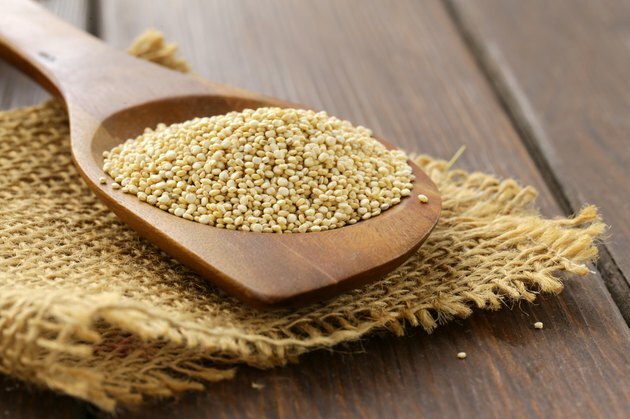 One animal study, published in Physiology & Behavior, found that mice fed a quinoa extract high in 20-hydroxyecdysone burned more calories throughout the day, and they absorbed less fat from their diets. Another study, from a 2012 issue of Obesity, found that mice fed a quinoa extract high in 20-hydroxyecdysone were less likely to gain weight on a high-fat diet than mice who didn't get the extract. While this research is promising, it's too early to say whether quinoa has the same benefits for people. Practice portion control when you eat quinoa, and add vegetables to your meal to boost your portion size without adding tons of calories. Serve your quinoa topped with a nutritious kale pesto -- made from blended kale, almonds and extra virgin olive oil -- for a healthy side dish full of leafy greens. Process raw cauliflower in your food processor until it forms a rice-like consistency; then mix it with your cooked quinoa to enjoy a larger portion size. Or make a filling quinoa salad for lunch by mixing cooked quinoa with roasted zucchini, bell peppers, onions, mushrooms, eggplant, and a homemade lemon-basil vinaigrette.